I am intimidated by the bald-faced hornets that forage nectar from raspberry blossoms and the yellow jackets that swarm over ripe blueberries, having experienced the stings of both. 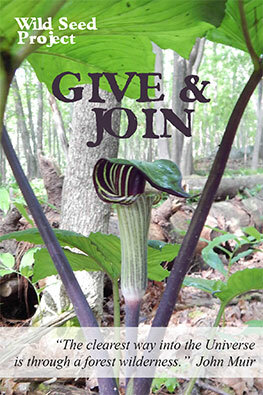 Yet each has an important role in our local ecosystem and in our gardens. I tolerate them, but give them a wide berth. Wasps are close relatives of bees and, from an evolutionary standpoint, they preceded bees. Bees are wasps that adopted a vegetarian diet, their hairy bodies enabling them to collect pollen. Many wasp species are smooth-bodied and thus do not collect large amounts of pollen from the flowers they visit, and even those with hairs lack the branched, pollen-trapping hairs of bees. Like butterflies and moths, wasps are “incidental pollinators,” moving around a few grains of pollen as they forage for nectar, perhaps dropping a grain on a stigma in the process. Unable to reach the nectar of many flowers due to their relatively short tongues, they favor flowers with shallow nectaries. In our garden we find them on goldenrod, raspberry, and plants of the carrot family, including Queen Anne’s lace. The wasp species discussed below are either predators as adults, capturing caterpillars and other insect larvae to feed their larvae, or they are parasitoids, laying their eggs in or on an insect host. After the eggs of a parasitoid hatch, the carnivorous larvae feed on the host. Once the wasp larvae become adults, they switch to a high carbohydrate diet fueled by flower nectar and rotting fruit. Wasps are among the gardener’s best friends, and they deserve our protection. At the forefront of consuming caterpillars and other insect larvae in the garden and wild landscapes are various predatory wasps. Common names associated with these wasps include sand wasp, digger wasp, mud wasp, hunting wasp, caterpillar-hunter, and cicada killer, all indicators of life styles found among various species in this group. Most predatory wasps nest in the ground, and most are solitary hunters of other insects, feeding their prey to their larvae. They are unlikely to sting a quiet observer. One warm August afternoon, I wandered through a coastal Maine landscape filled with regionally native plants, including the swamp milkweed, Asclepias incarnata. Standing among these tall plants, I was astonished by the diversity of insects crawling among the clusters of pink flowers. Earlier flower clusters had produced clusters of immature green seedpods that were covered with oleander aphids, Aphis nerii, a common exotic herbivore associated with milkweeds worldwide. I looked up from photographing the aphids and there, inches from my nose, was a giant black wasp crawling purposefully across a cluster of pink blossoms. She was both beautiful and threatening, black except for wings that reflected a shining metallic blue in sunlight. 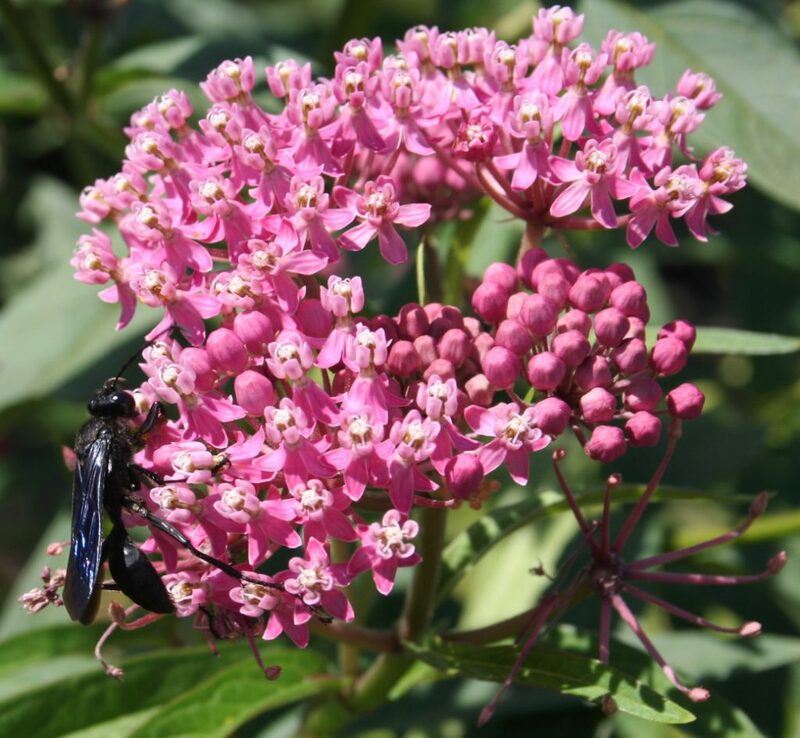 A great black wasp foraging for nectar on swamp milkweed flowers. 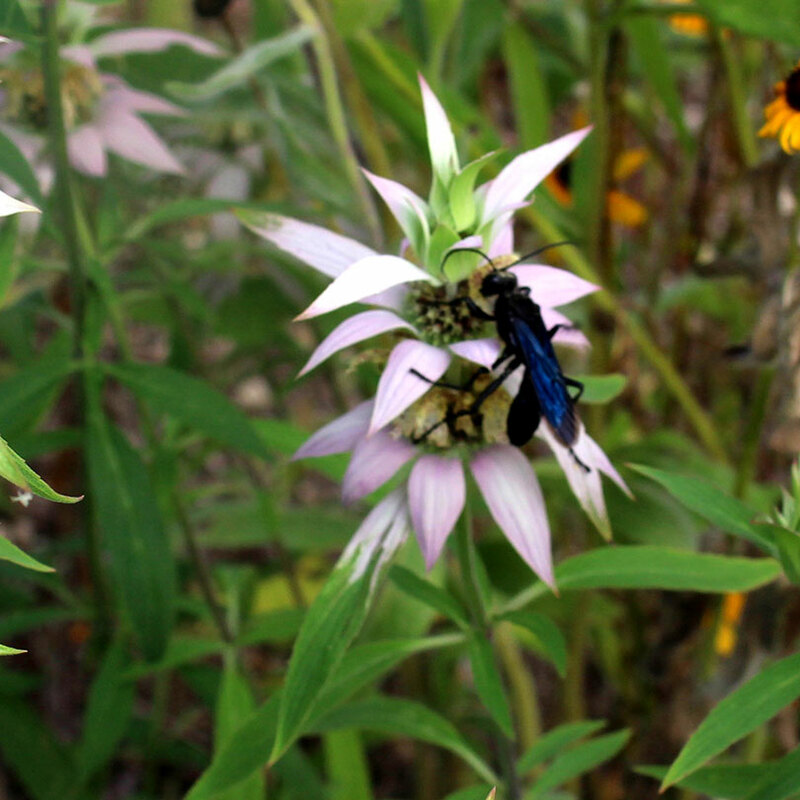 Great black wasps forage on a variety of garden plants including summersweet clethra shrubs (Clethra alnifolia), Spotted bee-balm (Monarda punctata) and goldenrod (Solidago spp.). Also known as “katydid hunter” and the “steel-blue cricket hunter”, Sphex pensylvanicus belongs to a group of solitary hunting wasps collectively called digger wasps, a reference to the construction of their nesting tunnels in soft soil. While not social insects, several digger wasp females may excavate nesting tunnels in the same area. It is the male wasp’s responsibility to pick the nest site and keep competitors away while choosing a mate. The larger female is the digger, constructing a long tunnel with multiple egg chambers. She uses her heavy-duty mandibles to loosen the soil and her legs as a rake, collecting the soil into lumps. Holding these soil lumps under her chin with her front pair of legs, she transports them one by one to a surface pile. Katydids and grasshoppers, often larger than she, are her primary prey. Once captured, the prey is paralyzed with three stings and dragged to one of the underground cells where the wasp glues a single egg to its underside. Although immobile, the prey will live until the egg hatches and the larva begins to feed. During its development, a larva will consume between two and six katydids or grasshoppers, so the adult female spends a good portion of her time provisioning each chamber of her nest. When a chamber is fully provisioned, she fills it, pushing in soil and tamping it down either with her head alone or with the aid of a small leaf or pebble, placing the “tool” on the loose earth and pressing her head against it while vibrating her abdomen. After each egg hatches, the larva spends about 10 days feeding and then pupates through the winter. Provisioning each nest chamber with sufficient food takes up much of the female’s time and the task becomes even more arduous when a captured and paralyzed insect never makes it to the nest. The female wasp can become a victim of kleptoparasitism (parasitism by theft) by house sparrows and gray catbirds as she drags her prey back to the nest. Researchers at University of Rhode Island determined that as many as one third of a wasp’s provisioning attempts are thwarted by avian theft. There are other species of predatory wasps with life cycles similar to that of S. pensylvanicus. One example is a species of sand wasp, Ammophila procera, easily recognized by a black abdomen that is long and slender except for a bulbous tip and a bright red band at the junction of the two sections. The thorax is black with silver bars on the side. A. procera is smaller than the great black wasp. A thread-waisted wasp (Ammophila procera) foraging on annual bachelor’s button. A. procera builds her underground nest in sandy soils. Like the great black wasp, the female is a nectar feeder and can be found foraging on a variety of garden flowers. She provisions her underground nest cavities with caterpillars and other insects, only one egg and paralyzed host per burrow. My work in the vegetable garden was interrupted one day when I spotted a thread-waisted wasp dragging a captured and paralyzed green caterpillar across one of the garden beds, then onto and across one of the granite rocks that framed the bed, and through the mesh of the deer fence. I grabbed my camera as soon as I saw her and was able to shoot several frames, only one of which was focused well enough to use. The problem was her speed! The caterpillar was much longer than her and must have weighed more, yet she dragged her load an estimated distance of 10 feet in about 10 seconds. By the time I could run to the garden gate and backtrack to the place where she had jumped through the fence, she had disappeared, perhaps to her underground nest. A third species in this group, Eremnophila aureonotata, is also common in our garden, often seen foraging on goldenrod. It is a striking creature, blue-black with silver markings on its thorax. The female is a caterpillar hunter specializing on the larvae of moths and skipper butterflies. 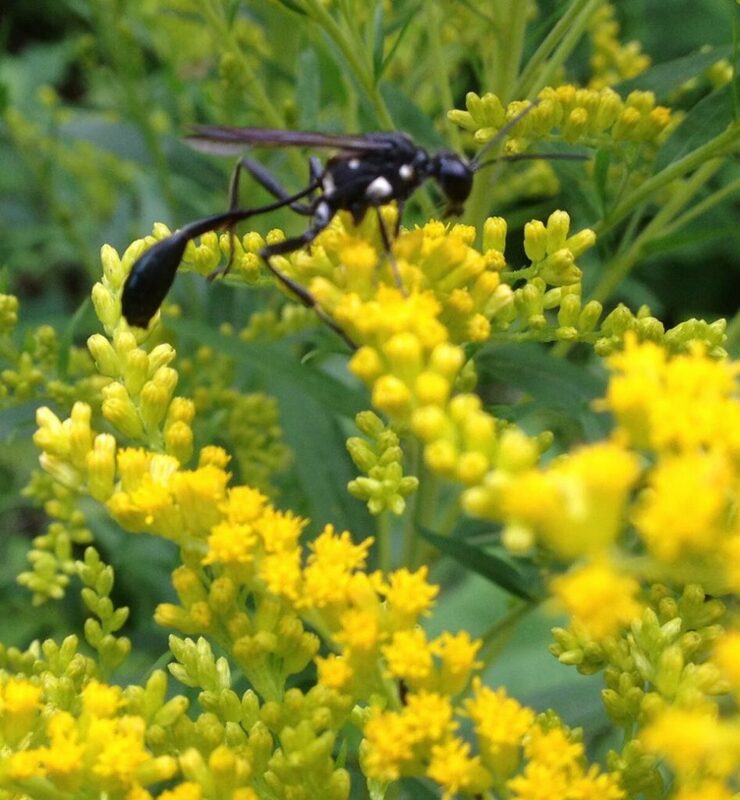 Goldenrod is a favorite among many species of beneficial wasps, including sand wasps. A parasitoid is an insect whose larvae live as parasites, eventually killing their hosts. There are a number of parasitoid wasp species in which the adult wasp feeds on the nectar of garden plants and lays its eggs in or on an insect host. After the eggs hatch, the carnivorous larvae feed on the insect prey captured by their mothers; once the larvae become adults and are less reliant on a high protein diet, they switch to a high carbohydrate diet fueled by nectar and rotting fruit. Perhaps the most unusual wasp encountered in our garden is Pelecinus polyturator, the American pelecinid wasp. The first time I saw one in flight, I mistook her for a damselfly. She glided slowly through the air on her short wings, sporting long antennae and a curved black abdomen that was five times the length of the rest of her body. While the adult pelecinid is a nectar feeder, its larva is a parasitoid, living off the paralyzed larva of a Japanese beetle or June beetle, killing it in the process. It begins with the female wasp exploring the soil with her long abdomen to determine the presence of the grub. She then deposits an egg directly into the beetle larva and moves on. When the egg hatches, the wasp larva feeds on the grub’s tissue until it is ready to pupate. Male pelecinids are so rare in certain regions of the species’ range that the females have adapted the means to reproduce without them, a process called parthenogenesis. In areas where males are more numerous, they do take part in reproduction. Pelecinid wasps are often seen resting on the leaves of garden plants. The term “ichneumon” comes from the Greek word for “tracker” or “footprint,” representing the female wasp’s task of tracking down various insect host species to feed her larvae. Depending on the species, the host may be a beetle grub; butterfly or moth caterpillar; ant, bee, or wasp larva; lacewing larva; or fly maggot. Ichneumon wasps are solitary insects that vary in length from a tenth of an inch to five inches. 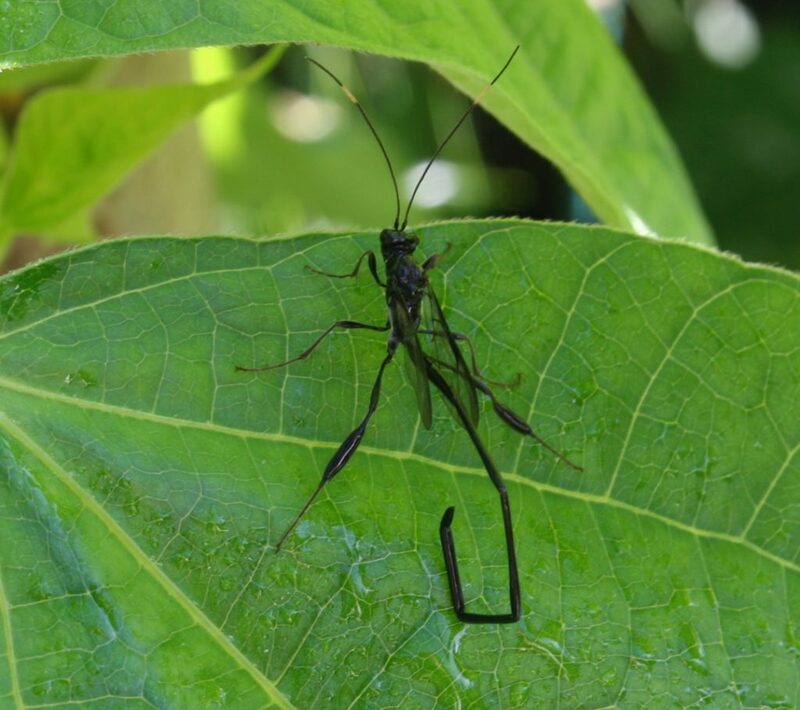 They are slender, the females often with long ovipositors. Ichneumon wasps are used commonly as biological control agents for the herbivores of commercial crops. Like pelecinid wasps, some ichneumon species prey on beetle larvae in the soil, while others lay their eggs in the larvae of wood borers. In the latter case, the female is equipped with a saw-like ovipositor that she uses to drill a hole in the bark to reach the larvae. As a group, ichneumon wasps play a large role in controlling populations of herbivores that attack crops such as tomato hornworms, boll weevils, wood borers, codling moths, and asparagus beetles. Ichneumon wasps with long ovipositors, such as this unidentified wasp, lay their eggs in beetle larvae living in the soil or beneath the bark of trees. You can ensure that the wasp species discussed above and others will thrive in your garden by growing a wide variety of native woody and herbaceous plants. For example, the flowers of winterberry holly (Ilex verticillata), summersweet clethra (Clethra alnifolia), and meadowsweet (Spiraea alba) are magnets for thread-waisted wasps, great black wasps, and other beneficial insects. Several herbaceous perennials are also very effective in helping establish a population of beneficial wasp species. Included in this group are native species such as goldenrods (Solidago spp. ), asters (Symphyotrichum novae-angliae), spotted bee-balm (Monarda punctate), golden and heart-leaved Alexanders (Zizia aurea and Z. aptera) and the exotic Queen Anne’s Lace (Daucus carota). A male great black wasp nectaring on spotted bee-balm Monarda punctata, a plant native to southern New England that grows well in Maine gardens. Many annual flowering plants help to fill the gaps in flowering of the perennials. Chief among them are bachelor’s buttons (Centaurea cyanus), a favorite of the thread-waisted wasps. Wasps that consume herbivores by predation or parasitism far outnumber the few species that create problems for humans by stinging or building their nests too close to the house. 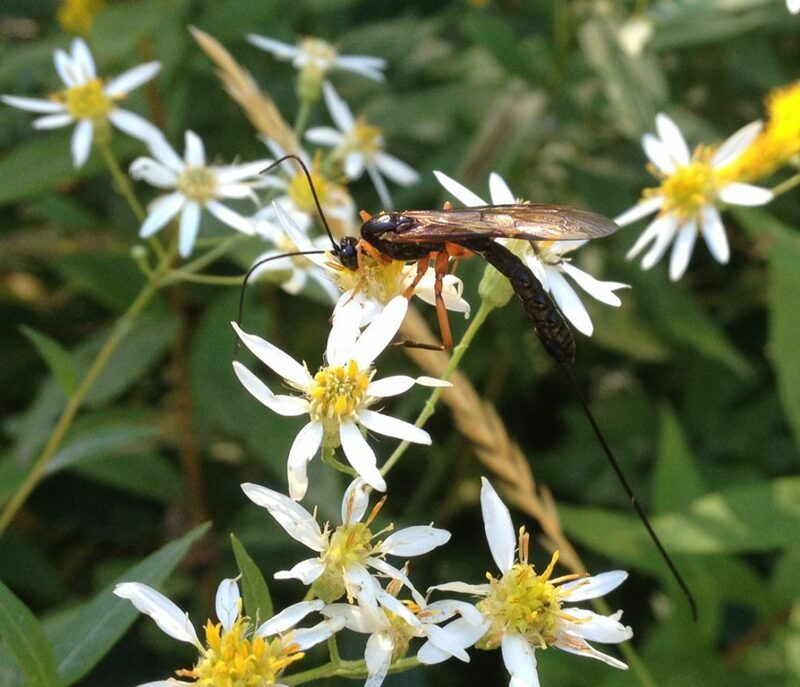 Great black wasps, sand wasps, and ichneumon wasps play an important role in how natural landscapes function and are among the gardener’s best friends. They deserve our protection. 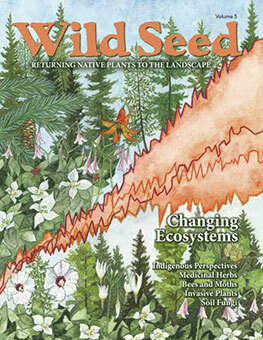 Reeser Manley has gardened in South Carolina, Washington state (while earning a Ph.D. in Horticultural Science), Massachusetts, and, for the last 16 years, in Maine. From 2007 through 2015, he wrote about the garden in a weekly column for the Bangor Daily News. 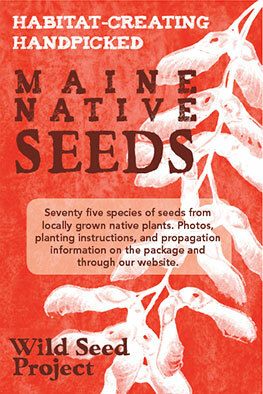 He taught courses in horticulture at the University of Massachusetts, Amherst, and University of Maine, Orono. In 2013, he retired from teaching chemistry and physics at a small high school on the coast of Maine to devote his time to gardening and garden writing.